[icon name=”user” class=”” unprefixed_class=””] Perry McLimore, MD., JD. Turf toe is an injury to the first metatarsal-phalangeal joint (MTP joint) in the foot. There are 5 metatarsal bones in the foot. Each articulates distally with the proximal phalanx of the toe. The big toe has a proximal and distal phalanx, whereas, the rest of the toes possess a proximal, middle, and distal phalanx. In turf toe, the big toe is hyperextended upwards (dorsiflexion) that injures the proximal phalanx-first metatarsal (MTP) joint complex. The first MTP joint allows for dorsiflexion (towards the knee) and plantar flexion (away from the knee) movements of the big toe. Some sliding, rolling, and compression may occur. Turf toe is most often encountered in football players but can be seen in soccer, rugby, and basketball players. The reason it is called turf toe is because a first MTP joint injury became much more frequent when artificial turf was introduced. Artificial turf is a harder surface than standard sod grass. There is less give-way on an artificial surface. In addition, athletes playing on artificial turf wanted more flexible or soft-soled shoes. This type of shoe decreases the amount of stability present at the first MTP joint. X-rays of the area will be taken searching for small bony avulsion fractures. Furthermore, seen on the x-rays is any sesamoid bony fractures or misalignment of the sesamoids relative to the MTP joint capsule. Grade 1: The plantar-MTP joint complex has been stretched. There is pin-point tenderness with minimal swelling and no bruising. Grade 2: Partial tearing of the plantar-MTP joint complex has occurred. There is widespread tenderness, moderate swelling and bruising present. Movement of the big toe is limited and painful. Grade 1: injury is treated by taping the big toe to the lessor toes to prevent first MTP joint movement. A carbon fiber, stiff insole may be inserted into the shoe to support the MTP joint. Grade 2: injuries require a walker boot and crutches for 7 to 14 days. Rarely, surgery is needed to repair turf toe. First MTP joint sprain or turf toe is a nagging and fairly common injury, especially in football players. 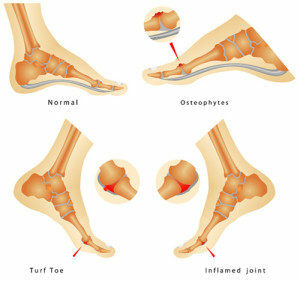 Depending on the severity, turf toe can be a debilitating injury. For professional football players, the average down time is 10 days.10Surgery is indicated for more advanced injuries and usually means 4 to 6 months off the field. McCormick J, Anderson R. “Turf Toe: Anatomy, Diagnosis, and Treatment.” Sports Health, 2(6): 487-494, 2010. McCormick J, Anderson R. “The Great Toe: Failed Turf Toe, Chronic Turf Toe, and Complicated Sesamoid Injuries.” Foot Ankle Clin, 14(2): 135-150, 2009. Kubitz E. “Athletic Injuries of the First Metatarsophalangeal Joint.” J Am Podiatr Med Assoc, 93(4): 325-332, 2003. Coughlin M, Kemp T, Hirose C. “Turf Toe: Soft Tissue and Osteocartilaginous Injury to the First Metatarsophalangeal Joint.” PhysSportsmed, 38(1): 91-100, 2010. Tewes D, Fischer D, Fritts H, et al. “MRI Findings of Acute Turf Toe. A Case Report and Review of Anatomy.” ClinOrthopRelat Res, 304: 200-203, 1994. McCormick J, Anderson R. “Rehabilitation Following Turf Toe Injury and Plantar Plate Repair.” Clin Sports Med, 29(2): 313-323, 2010. 2 Responses to "Turf Toe"